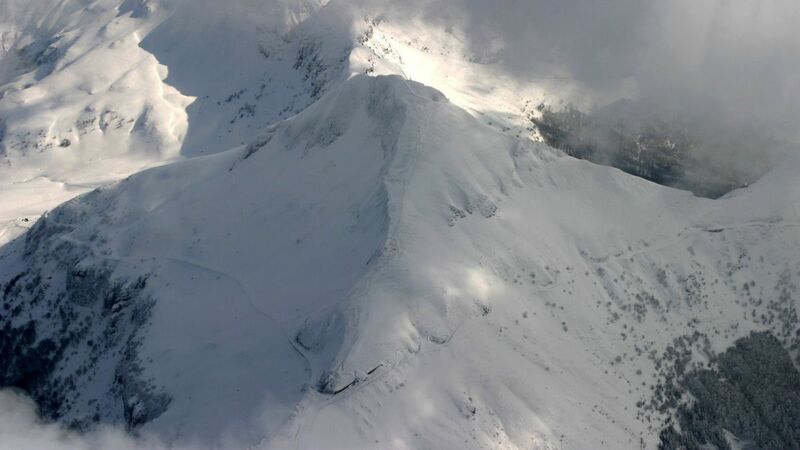 The Col du Pas de Peyrol opens on Saturday, 5th of May! The first stage of the Dauphiné Libéré passes by the Pas de Peyrol (June, 9th). Spend my entire childhood in the Haute Loire, cyclotourist by accident, in love with the Cantal in all its fomrs since nearly 30 years... it was little more than a completely foolish idea was growing under my skull cap. Already conquered by the Puy Mary and its 360° panorama on the mounts of the Cantal, my first climb of the Pas de Peyrol starting in Mandailles in 2010 during the Cyclomontagnarde of the Massif Central with departure in Aurillac, left me on my hunger... Two years later and an other Cyclomontagnarde make me cross the path with Hugo who is Cinglé, Fêlé, Baron du Soulor...!!!??? A few more pedal strokes and the idea of a challenge around the Puy Mary and the Pas de Peyrol made his way in my little head. And here we are at Murat with Hugo, June 17th 2015 to make this dream come true. Pure happiness... and we were "Grand Fada du Puy Mary"
From the top of the Puy Mary, the largest European volcano and listed as a "Grand Site de France", you have an unspoilt 360°-view of the Cantal and the seven glacier valleys. 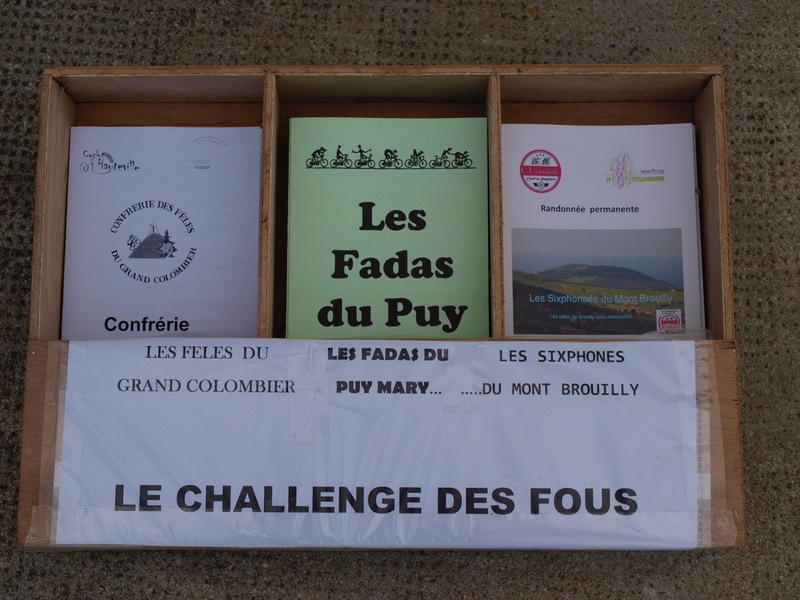 “The Fools of Puy Mary” is open for everyone starting at the age of 18 years who realizes in one day two, three of four different climbs of Col du Pas de Peyrol/Puy Mary (1588m) there and back with his bike with only his own muscular strenght. 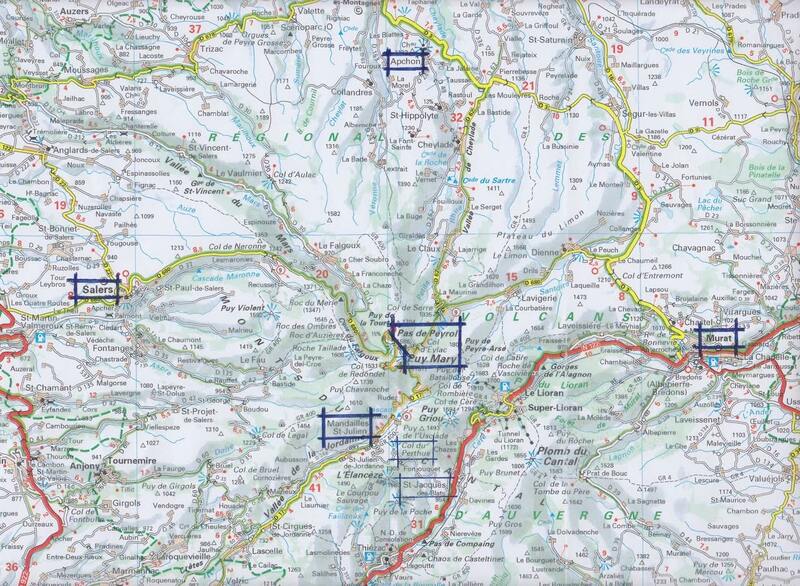 The biker chooses the starting place and the order of the climbs! The biker who achieves two different climbs becomes FADASSOU* (6 possibilities). The biker who achieves three different climbs becomes FADA (4 possibilities). The biker who achieves four different climbs becomes GRAND FADA. *Fadassou: a diminutive of fada typical in the Auvergne. The registration must reach the responsible correspondent (info@lesfadasdupuymary.eu), together with the payment (€10), two to three weeks before the attempt. Payment: only bank transfer on the bank account is accepted. The attached member will then receive a frame-plate and a check card on which he collects the necessary stamps and mentions the hours of transit. If it’s not possible to receive a stamp, it may be replaced by a photo. We further rely on the honesty of the participant. The participants must respect the highway code just like any temporary measures and a lighting have if this would be necessary. The participants are required to have a liability insurance. The organizer can never be held liable in case of accident. After delivering the stamped check card the new member receives back his check card with the hierarchical sequence number on it together with his certificate and a souvenir. Starting at the top is also possible! By adding the same day the two climbs of the Col de Pertus (1309m), one starting at Mandailles (940m) and the other starting at Saint-Jacques-des-Blats (993m) to the "Grand Fada" track. this is a 22km and 765 climbing extra or in total 179km and 4020m climbing. Any cyclist who has made any of the following treks: the Fêlés du Grand Colombier, or the Fadas du Puy Mary or the Sixphonnés du Mont Brouilly is automatically enrolled in the Challenge des Fous. This honorific challenge is validated to any cyclist who has realized his three permanent treks and achieved those by his muscular strenght only. Only cyclists holding the rank of Nabuchodonosor of the Sixphonnés du Mont Brouilly without electric assistance, will be admitted to participate in this challenge. - the grade of Totalement Déjanté is awarded to any cyclist who has approved the three treks within a maximum of one month from day to day. - the grade of Intenable Déchainé is awarded to any cyclist who has approved the three treks in three consecutive days.